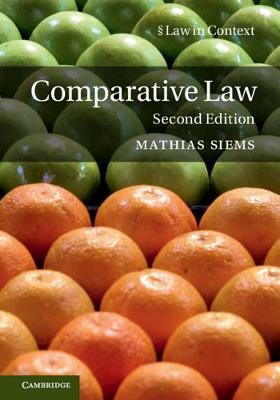 Comparative Law offers a thorough grounding in the subject for students and scholars of comparative law alike, critically debating both traditional and modern approaches to the subject and using examples from a range of legal systems gives the reader a truly global perspective. Covering essential academic debates and comparative law methodology, its contextualised approach draws on examples from politics, economics and development studies to provide an original contribution to topics of comparative law. This new edition: is fully revised and updated throughout to reflect contemporary research, contains more examples from many areas of law and there is also an increased discussion of the relevance of regional, international, transnational and global laws for comparative law. Suitable for students taking courses in comparative law and related fields, this book offers a fresh contextualised and cosmopolitan perspective on the subject.